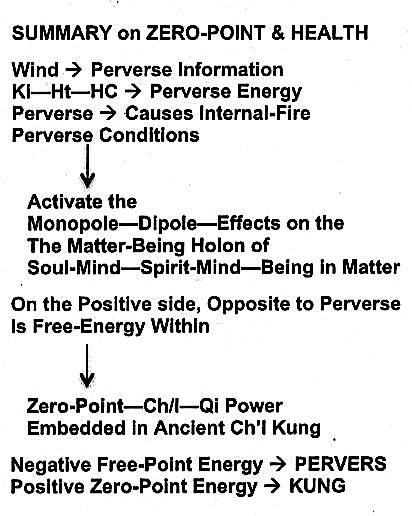 NAMELY, THE FOLLOWING HOLON INTERACTION BETWEEN MONOPOLE—ZERO-POINT—DIPOLE <——> INFORMATION—ENERGY—ALLOPATHIC MEDICINE, WHICH IS SHOWN BELOW. PRESENTED ALSO ARE THE PRE-QUANTUM HEALTH CONCEPTS OF WIND (FENG), THE MOST MYSTERIOUS, UNEXPLAINABLE CONCEPT IN CHINESE HEALTH PHILOSOPHY. The above diagram also explains the connections between Information—Energy—Allopathic Medicine and Zero-Point Technologies. With this brief summary, the experimentation—validation—execution of the Zero-Point Monopole—Dipole Matter-Being Paradigm on Health and future vacuum technology, as outlined in the continuation of Postings 15, 16, 17, and 18, can now be preceded with proper funding. 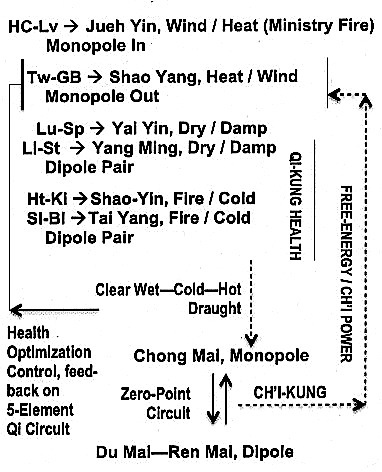 The above diagram connects Zero-Point Energy to Health. The Chinese Character for Wind is Feng. In short, Wind (Feng) is a Pre-Quantum concept on Local—Non-Local Health as conceived by the Chinese, expressed in the Classic of the Nei-Ching. Holon HC (—-> Ck-7—Ck-4—Ck-2) identifies the Local—Non-Local Involution Logic of the individual encoded in the Vacuum Computer. Holon Tw (—> Ck-6—Ck5—Ck-1) indicates the stability Logic of the individual’s Local—Non-Local Health, defined by the difference between Logic of Now the Involution Logic encoded in the Vacuum Computer. The order of these points listed below have no significant. The point descriptions are quoted from the book Grasping The Wind by Andrew Ellis, Nigel Wiseman, and Ken Boss. SI-12: Grasping the Wind (bing feng), A deep depression is found at this spot when the arm is raised. An invasion of external wind can get caught in this depression and cause shoulder disorders. In a manner of speaking, the point catches or “grasps” the wind. SI-12 is treated to relieve this type of shoulder pain accompanied by inability to raise the arm. Bl-12: Wind Gate (feng men), Bl-12 is called Wind Gate both because wind pathogens enter the body there, and because the point can be used to treat exterior wind patterns. The alternate names feng fu, Wind Mansion, and Heat Mansion, slso reflect this line of reasoning. Tw-17: Wind Screen (yi feng), This point is located behind the ear, which acts as a screen for the point, shading it and protecting it from the wind. In addition, the point may be utilized to dispel wind, thus screening the body from wind pathogens. GB-20: Wind Pool (feng chi), The depression in which GB-20 is located resembles a pool in the landscape of the body. 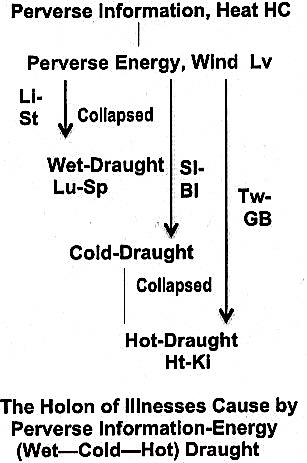 Wind pathogens are said to collect in this depression, and the point is used in the treatment wind disease. GB-31: Wind Market (feng shi), Wind disorders can be treated by applying acupuncture or moxibustion at this point. Furthermore, wind qi may gather in this area like people gathering at a market or fair. GV-16: Wind Mansion (feng fu), This point is used to treat wind disorders such as wind strike, stiff neck, headache, aversion to cold, visual dizziness, hemiplegia, head wind and wind cold. It teats both endogenous or exogenous wind, especially when that wind affects the brain. GV-16 is further considered to be appoint at which wind pathogens enter the body. 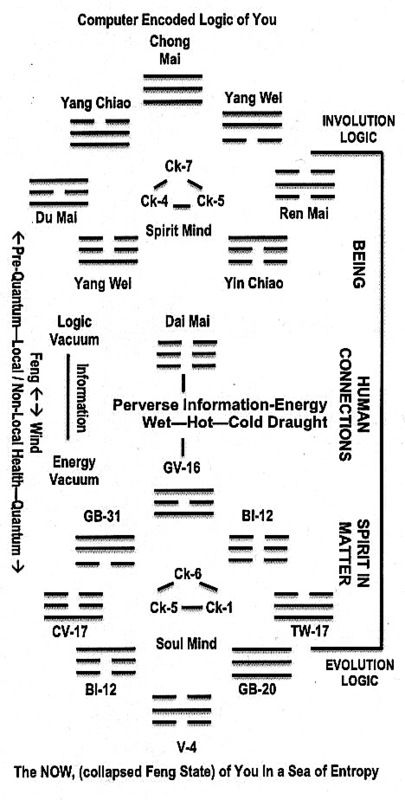 CV-4 (guan yuan, dan tian, …, 26 alternative names), Depending on which meaning of the character guan is considered, CV-4 is a “passageway of original qi (—> Ch’i)” the “ critical juncture of original yang and original yin,” or the place where “original qi is stored” [locked in —> computer encoded]. The rendering of this name as Origin Pass is an attempt to include all these ideas. The plethora of alternate names for this point are a result of it being the site of uterus (i.e., blood chamber), the cinnabar field (dan tian), and the life gate fire. CV-17 (dan zhong), This point is named after its location in the center of the chest. The Spiritual Axis calls this area of the body the “palace of the heart governor [Heart Constrictor, HC. This point identifies who you are, namely, the you encoded inside the Vacuum Computer]. This may explain the imperial nature of the point names in the region.